Here's mine! We got enough donations over the holidays to cover the entire cost of the cage. I have another stealth wheel on the way so I can finally get rid of the 3 year old Silent Spinner. This cage holds my own 12 rats. There are 6 girls on the top and 6 boys on the bottom. It is very full and I can already see that I am going to have to do a lot of cleaning, but half of the rats in there are over 2 years old so it's not SO bad. Thank goodness I work from home. The cage was waiting for me on my doorstep when I got home at 10pm on Monday. I was so disappointed that there wasn't enough time left to put it together that day, but it turned out that I needed two whole days to get it just right! It arrived with absolutely NO damage at all. One of the square connectors needed a few knocks with the hammer to get it to fit, but otherwise it went together with no tools required. I ordered from allpetfurniture. 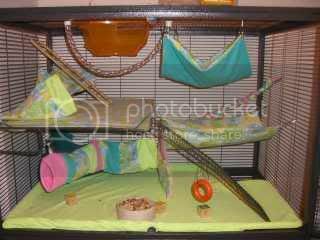 Here are some pictures of my new cage. And Squeeks taking up the whole runny-ball. Anyways, wheeeee! It's so fantastic! Drache - I LOVE YOUR ROOM!!! Right now I have 12 rats in the CN, 2 who are separated for now until one of them is big enough for the CN, and 4 fosters (in the white/red cage on the chest of drawers). 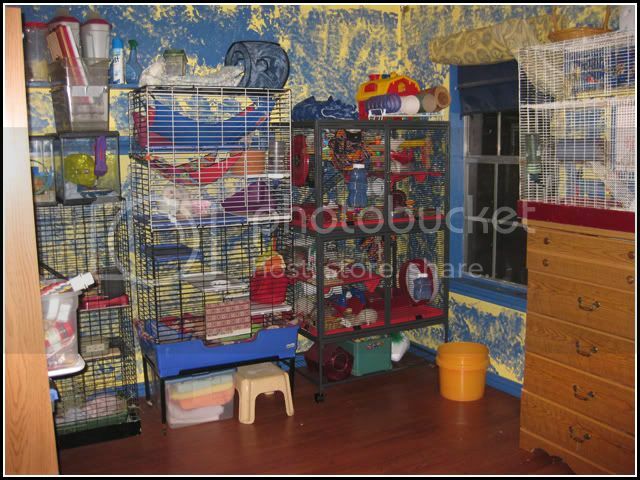 The other cages you see are my three ferrets and my prairie dog and richardson's ground squirrel. 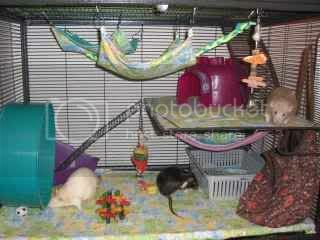 On top of them I have a kangaroo rat, 2 chinese dwarf hamsters, and the two separated rats. Penny, thanks! That was actually my sister's old bedroom that she painted herself. Mine is red and black. 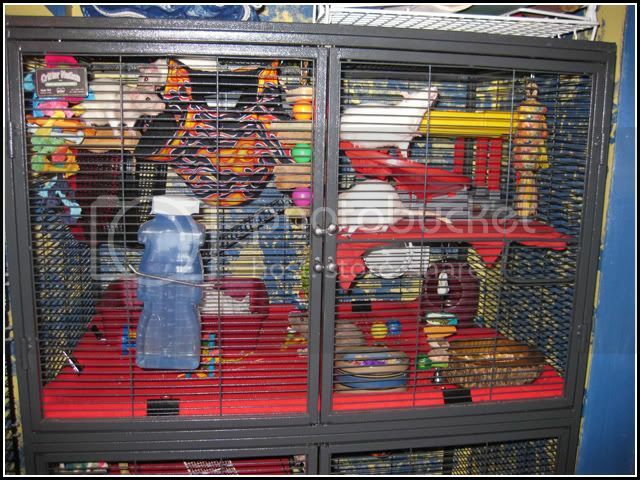 Rebecca, your cage looks so awsome! I adore that flame fabric, it's so bright and fun! This is my cage. It came tuesday, and I had it together in 20mins, Then i decorated it. 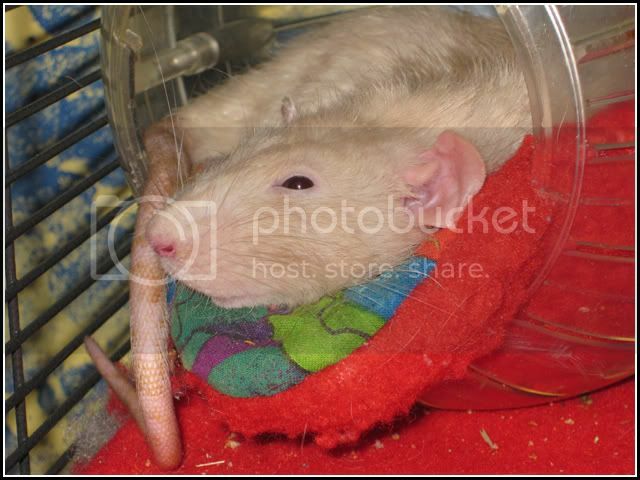 My girls will not use thier hammocks, they never have and they've only slept on the bottom level. I put thier food on the second level so they will actually have to go up there and what do they do run up grab a mouth full of food then back to the bottom to enjoy it. I have 3 rattie girls in there now. At least they use thier wheel now. That's a lot of room for three girls! 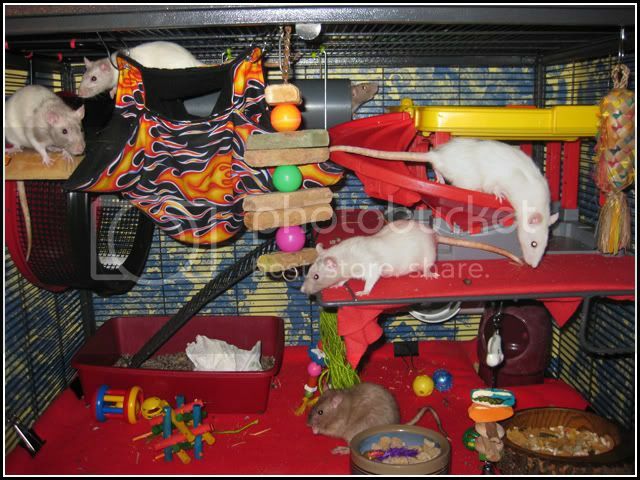 Lucky ratties! It's funny your girls only stay on the bottom, mine are always hanging out on top. I think so. It's like a car wash for toy cars. It's not hot wheels brand though. BTW, I picked up Henri. I am getting him neutered for you next week. I have TONS of scraps. I need to go through and see what I can braid and what just needs to be cut up for some soft stuff to drag around and piddle on. I wish someone on here lived closer to me cause braiding those things just kills my hands. And Drache, what's that thing in the second pic in the upper right hand corner? It looks fun, the woven colorful looking chew toy. *gasp* OOOH! I wonder, how big is the smallest? There are about a bajillion threads about CNs but I figure I'll just add to this one. I got my CN last night! Thanks again Julie! You're the reason I have it so soon! Overall condition is not perfect but not horrible. The box was in decent shape and not a single broken pan to be found! However, every single powder coated piece has at least a little coating scratched off (completely due to how Midwest boxes them), two slightly bent bars (one on a ladder and one on a shelf - both barely noticeable and cause no problems), the lock on one of the wheels was snapped off, and the doors on one panel are off at least an inch - the point where they won't latch and unlatch correctly (another Midwest issue). For the little powder coated scratches here and there, I think I'm just going to buy some dark gray rustoleum and dab it on the spots so I don't end up with rust later on (I want this cage to last!). For the door and wheel I'm going to take pictures and ask for replacements. I'm not too disappointed. 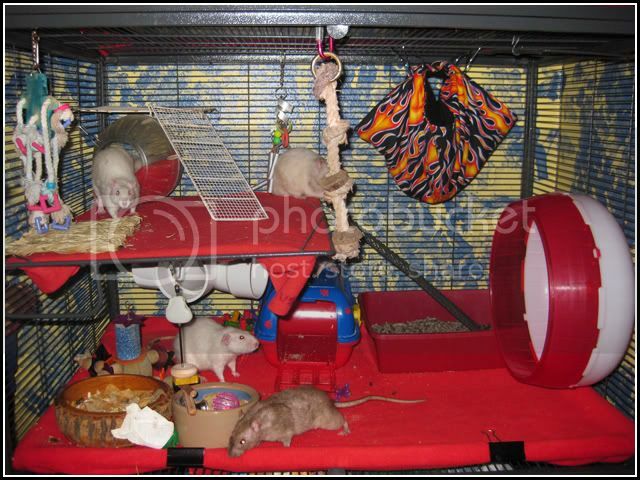 I don't need the cage right away, and I need time to rearrange the rat room anyway. Pictures probably in another week or so! eta - I just called All Pet Furniture. They are going to be getting in touch with Midwest and sending my new door and wheel asap. The guy I spoke with was very nice and said he didn't need pictures as evidence right now, but would call me back if Midwest requested some. He said the parts can take up to 2 weeks to get here, and that works for me! I'm still very happy with my purchase so far. Next step is to see how I like it once there are ratties pooping and peeing in it constantly! I want my CN so bad! I was supposed to have it by now, but with things like school starting (had to buy books), and my brother graduating from bootcamp, I just haven't been able to order it yet. I'm really really really hoping that I will be able to get it for my birthday now. I reallllllllllllllllllllllllllllllllllllllly want a CN!! My current cage is only a few months old though, and it's nice, I like it. Not as easy to clean as the CN I'm sure though. The doors and horizontal bars are awesome, must have! I just restarted weight watchers and told hubby that if I lose 60lbs & don't have the CN yet, I'm buying this as my reward; I bet THAT would make a great WW success story! Hey Drache... where did you get that water bottle from? The water bottle looks like a water buddy. Some of the rabbit sites have them. Thanks, julztoni! I just bought some at Woodland Bird Supply for about $10 each (not including shipping) since I got six of them. Yep... you heard me right... I said "six". 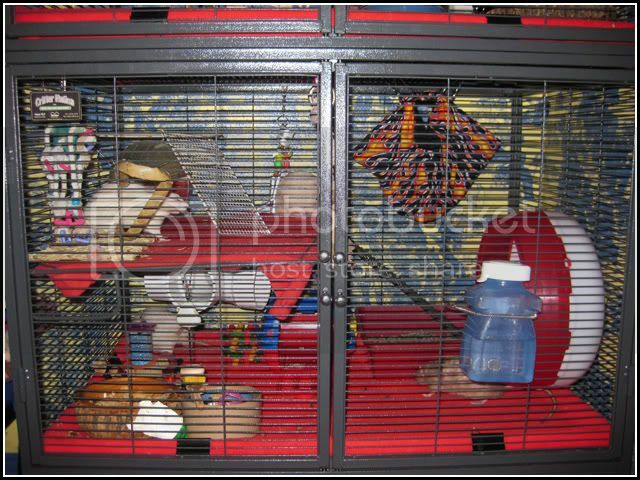 LOL I've got two cages (one ferret nation and one critter nation) that I want to put two bottles in each of them. And then I want to have one for the traveling cage and keep one as a spare. Yep! Water Buddies. I have had them for ages. They are the best water bottles ever. I have always had awful, leaky water bottles... still do... but I'm scared to try the Water Buddy for fear that they won't be able to figure it out. Have you had issues with them not being able to figure it out? Nope. They lick them the same way they lick a regular water bottle, but it seems to be easier for them since they don't have to push as hard to get the water to come out. Even the little baby wildie I just weaned is drinking out of one.